Nexo's RS 15 was launched at prolight + sound show 2008 in Frankfurt, highlighted at InfoComm 2008 in Las Vegas and at Integrated Systems Europe (ISE) 2009 in Amsterdam. The first arrival in Nexo’s new patent-pending RS (Ray Sub) Series is the RS 15, a low-profile high-output, modular, scalable bass cabinet which is capable of operating in both omni-directional and cardioid modes. Comprised of a 15 inch transducer with a frequency response of 35Hz – 200Hz in omni or 35Hz- 150Hz in directional mode and a sensitivity of 105db SPL, the RS 15 presents an unchallenged versatility for installations and touring requirements. The patent-pending RS15 offers directive subwoofer coverage from a standard bass reflex subwoofer architecture. Simply turning the cabinet vertically or horizontally will change its characteristics from omni to cardioid. Digital signal processing, via NX242 TDcontrollers, allows the RS15 to display precise cardioid pattern control through the DSP-processed correlation of acoustic distances between transducer and vent sources. These sources are linearly positioned in the output direction of the cardioid pattern. In cardioid mode, the sidewalls of the RS15 (where the rigging system is attached) behave as the cabinet’s front and rear face. As such, the RS15’s cardioid LF and VLF energy propagates from only one end of the enclosure, rather than from the front face. This behaviour is maintained regardless of whether speaker cones are positioned on the side or top. The RS15’s cardioid pattern reduces rear levels by 15-18dB, minimizing rear/side wall reflections. 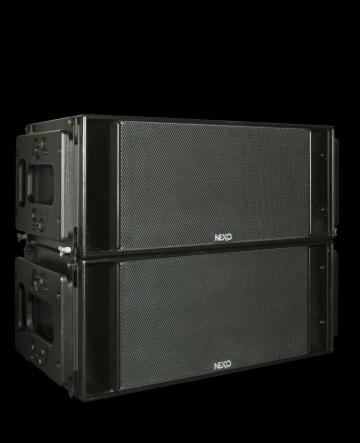 Designed in tandem with Nexo’s new GEO S12 Series of loudspeakers, the RS15 also applies across the entire Nexo product line, and can be deployed in nearly any sub-hire rental. It will be paired with Nexo’s NX242 digital TDcontroller or with the S12 TDcontroller, which provides analogue LF processing to yield a traditional omni-directional (cone-forward) LF and VLF pattern control and performance. Ray Sub Technology is Nexo’s newest subwoofer technology, raising the bar for the standards and application capabilities of the subwoofer. The patent-pending technology is based on optimizing positioning and phase relationships of radiating surfaces in vented enclosures, permitting acoustic distance from rear to front sections to always increase as frequency decreases. Consequently rear and front sections sum up efficiently over the entire subwoofer bandwidth, allowing for an average of 5 db gain from the rear section in the forward direction and cancelling in the rear direction. Utilized in a stand alone format, Ray Sub Technology allows the same cabinet to be configured for any polar pattern, omnidrectional as a standard direct radiating subwoofer when speakers are facing the audience, or highly directional when a speaker cabinet is rotated sideways or upwards. Used in arrays, Ray Sub subwoofers can be set back to back, front to front, in vertical columns, and when column length is sufficient be beam-steered upwards or downwards.